May 2015 n Performance & Hotrod Business n 63 can come in widths of 40, 50, 54, 60, 72 and 80 inches. There are some other sizes, but you get the picture. It varies by type and manufacturer. Besides buying carpet by the yard, it can all be purchased as pre-made cut- and-sewn kits for older vehicles and pre- molded for late-model vehicles from carpet manufacturers. There are many different types of carpet sold, but the most common are cut pile and loop pile. Cut pile is woven first into loop pile. The loops are cut evenly with a cutter to the same height and allowed to tuft. This style of carpet gives the appearance of a plush, soft carpet. And it also looks dense. This is the most common carpet used today. Loop pile is a continuous fiber that is woven into the carpet backing to give it a looped appearance; it was commonly used in vehicles from the mid-'50s to the late '70s. A word of caution if using this type of carpeting: be very careful not to snag it, as it will pull easily from the backing, leaving a bare spot. Some other types of carpet used in more specific applications include square weave wool and gross point nylon loop used for older restoration and foreign vehi- cles, and Daytona Weave, used for early Corvettes. There are many other variations of specialty carpet manufactured, but what I have listed are the most widely used. 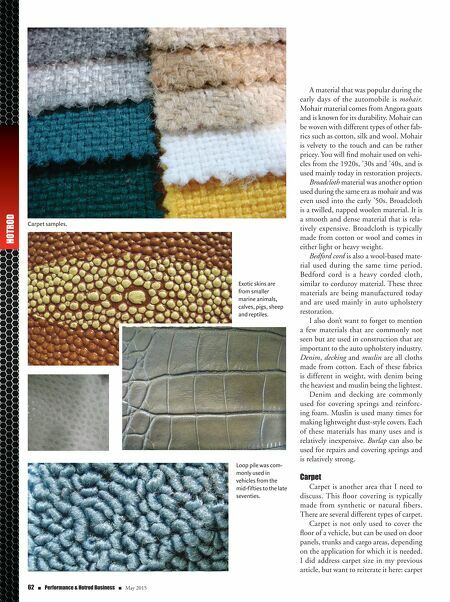 Hides & Skins I talked about leather hides and how they are bought and measured in my last article. Remember, a hide of leather is actually the outside skin of an animal and includes the hair and fur. Animal hides often reflect the life of an animal and can be marked and scarred by insect bites, barbed wire and brands, which can be reflected in the surface of the leather. The actual hides are thicker than the skins used in the upholstery industry. The climate and environment where the animal lived can determine the thick- ness of the hides. Cold-weather animals usually yield a much thicker hide than an animal that lives in a warm climate. Thicker hides usually will have fewer markings; these hides generally bring a premium price and a greater yield to the tanner. These hides are typically larger than 35 square feet. Some popular animal hides are cow, horse, buffalo, elk and zebra. Skins, on the other hand, are from smaller marine animals, calves, pigs, sheep and reptiles. I consider these types of hides more of your exotics and they are usually much smaller than those from the bigger animals mentioned. Skins are usually smaller than 35 square feet. A disadvantage of these skins is that it often means that many skins will have to be sewn together to complete a project. In some cases, these skins can produce a softer, more luxurious feel depending on the animal. Some examples of these are calf, pig, deer, goat, rabbit, kangaroo, seal, ostrich, crocodile, alligator, lizard, snake, eel, stingray and frog. I love using these when working on bike seats or for awesome accents on a custom job, because they can really set the work off. Now, when we talk about leather, if I went into the interior process of taking it from an animal hide to the tanned leather we use, I could write an entire article about the process. As I don't want to bore you with all the details, I will touch on a couple of things. Top-grain leather does not mean that it is the best leather, but is a term given to a hide's outer layer after it has been split. Split leather is the remainder of the leather once it has been split from the top grain. Split leather is used to make suede and has a velvety feel. When we talk about leather quality, there are two different kinds: full-grain leather and corrected-grain leather. Full- grain is top-grain leather and is the best- quality top-grain leather. It is free from scars, brands and insect bites. The last thing to bring up about leather is that leather is either surface-dyed or vat- dyed. Surface-dyed leather is just that; the color is on the surface. You will find that older vehicles had surfaced-dyed leather. Vat-dyed leather is dyed completely through the hide. Hides used today are vat-dyed hides. 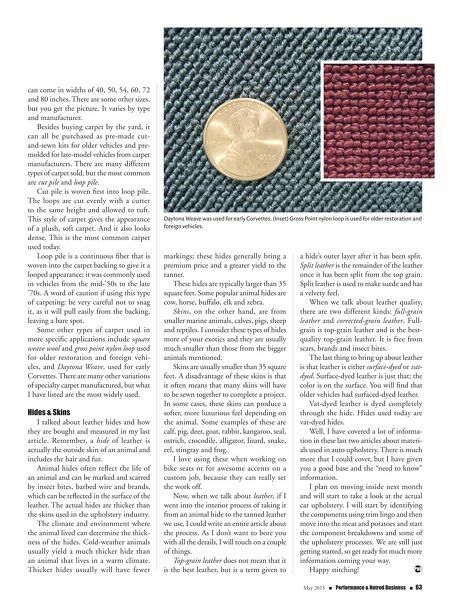 Well, I have covered a lot of informa- tion in these last two articles about materi- als used in auto upholstery. There is much more that I could cover, but I have given you a good base and the "need to know" information. I plan on moving inside next month and will start to take a look at the actual car upholstery. I will start by identifying the components using trim lingo and then move into the meat and potatoes and start the component breakdowns and some of the upholstery processes. We are still just getting started, so get ready for much more information coming your way. Happy stitching! Daytona Weave was used for early Corvettes. (Inset) Gross Point nylon loop is used for older restoration and foreign vehicles.